Penobscot Valley Hospital of Lincoln is seen, Nov. 28, 2014. A community hospital in Lincoln filed for bankruptcy protection Tuesday, citing steep declines in patient admissions in recent years amid a larger economic downturn in the Lincoln Lakes region. 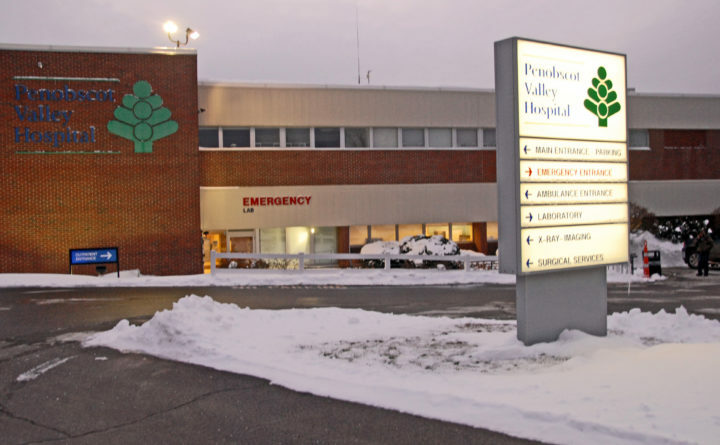 Penobscot Valley Hospital, a 25-bed critical access facility, will remain open as the Chapter 11 bankruptcy filing makes its way through federal bankruptcy court. No layoffs are planned, and the hospital’s 164 workers will continue to receive paychecks, hospital CEO Crystal Landry said. The hospital has seen in-patient admissions drop 65 percent over the last four years, along with a 10 percent decrease in overall patient volume, Landry said. Its annual revenue fell more than 18 percent between 2011 and 2016, according to Penobscot Valley’s annual I-990 tax filings, to $21.5 million from $26.4 million. The hospital lost $1.9 million in 2016, the latest year for which an I-990 is available. The last year it didn’t lose money was 2011. Penobscot Valley said its lower patient numbers were among “the ripple effects” of the closure of the Lincoln Paper and Tissue LLC mill, then the town’s largest single employer, in 2015. In addition, the hospital said a lack of Medicaid expansion in Maine and cuts to Medicaid reimbursement rates have hurt its bottom line. “We have made tremendous strides over the last three years in bringing our operational costs in line with revenue. Legacy debt is the issue here, and Chapter 11 allows us to restructure that debt so we can keep our doors open and ensure that our community continues to have a hospital close to home,” Landry said in a statement. The bankruptcy filing should have “minimal impact” on hospital operations, according to a statement from the hospital. Businesses and organizations commonly use Chapter 11 to reorganize their debts so they can continue operating. The hospital is Lincoln’s second largest employer behind the local schools and ahead of Walmart and Hannaford Supermarkets, Town Manager Rick Bronson said. Penobscot Valley owns five parcels in Lincoln, including the hospital property itself off Transalpine Avenue, which the town values at $8,249,100 for tax purposes, Bronson said. The hospital pays no taxes on its main building because it is a nonprofit organization, but it pays $13,374 in property taxes on the four other parcels — three buildings it rents to medical practitioners and an empty lot — at Lincoln’s current tax rate, $23.10 per $1,000 in property value. The loss of Penobscot Valley through bankruptcy, Bronson said, would therefore be negligible to the town’s financial situation, but it would cut into Lincoln’s role as a service hub for the Lincoln Lakes region, Bronson said. The next closest hospitals would be in Bangor and Millinocket, although area residents could still receive medical care at Health Access Network of Lincoln, a walk-in and non-emergency medical center that serves 19 Lincoln-area towns; a U.S. Department of Veterans Affairs clinic; and Health Access offices in Lee and West Enfield. The hospital hopes to emerge from the bankruptcy process, which can take 12 to 18 months, in a stronger financial position, Landry said. “Healthy patient outcomes remain our number one priority,” said Dr. Paul Turnquist, president of the hospital’s medical staff. Penobscot Valley Hospital is among the first hospitals in Maine to file for Chapter 11 protection. Parkview Adventist Medical Center in Brunswick filed for Chapter 11 in 2015, and Mid Coast Hospital in Brunswick later bought it. The head of the Maine Hospital Association said more of the state’s hospitals could be headed in Penobscot Valley’s direction and filing for bankruptcy protection, which is the result of declining rural populations, a still-sluggish northern Maine economy and lagging Medicaid and Medicare reimbursements. Ten hospitals nationwide filed for bankruptcy last year, according to Becker’s Hospital CFO Report. Faced with falling revenues and losses, Penobscot Valley has made changes to its operations in recent years. It ended labor and delivery services in 2014 and eliminated of 10 full-time positions in 2016. It has also outsourced a number of key functions. It was among three rural hospitals in the state that outsourced their management to Quorum Health Resources, a Tennessee-based for-profit company, though Penobscot Valley says that arrangement ended in July 2018. Quorum has also served Calais Regional Hospital and Cary Medical Center in Caribou. Penobscot Valley paid Quorum $341,000 in 2016, according to its I-990. The hospital outsources its emergency room staffing to EmCare, which provides staffing at emergency rooms around the country. Penobscot Valley paid the Texas firm $509,000 in 2016. The hospital also paid $606,000 that year to another contractor, Nurse Anesthesia of Maine in Brewer. Correction: An earlier version of this article incorrectly stated that Penobscot Valley still contracted with Quorum Health Resources.